The former PM has been talking about mental health for most of her life. Former Prime Minister Julia Gillard has been talking about mental health issues for most of her life and now, in her new role as Chair of beyondblue, she's looking to continue that by tackling Australia's high suicide rates with messages of resilience. 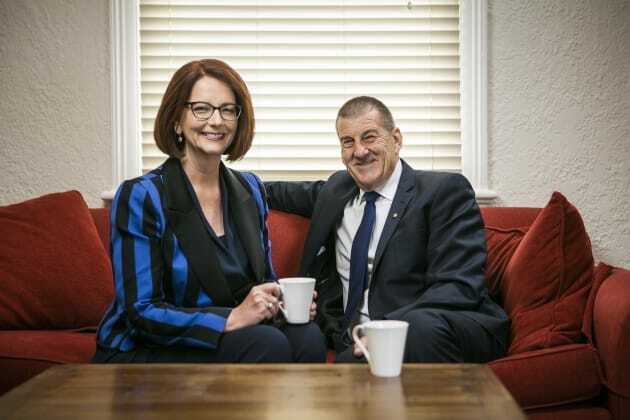 Gillard took over from former beyondblue founder, chair and Liberal politician Jeff Kennett on Saturday and told HuffPost Australia her interest in raising awareness about mental health issues stems from the many conversations she had as a child with her father, who worked as a psychiatric nurse. "My father was a psychiatric nurse, he worked in that profession for a very long time and that meant that for my family it was common for us to talk about mental health conditions including very acute mental health problems, psychosis and the like, because that's what Dad did at work," she said. "It was sort of a normal conversation for us in my home and having being brought up in those kinds of circumstances. "Then seeing how much mental health was hushed up in the world in which I became an adult, it did really create in me a sense that we should be trying to get people to talk about this more." Gillard, who has also been on the Board of Directors of beyondblue since 2014, said she is honoured to have been offered the role as Chair and sees it as an opportunity to extend past the 17-year leadership of Kennett and "to help keep building and shaping an organisation than means so much to the lives of Australians". Beyondblue is one of Australia's leading information and support services for people dealing with depression, anxiety and other mental health issues. "There's not going to be a sharp disruption between the direction of beyondblue under Jeff and what I'm intending to do," she said. "What we want to do now is to make sure we're focusing on the area of suicide. Originally beyondblue focused on depression, then also decided to work on anxiety; now, beyondblue is seeking to work strongly in the area of suicide, and it will be during my period as chairperson in that we'll fully develop that strategy." The mental health organisation announced Gillard as Kennett's replacement in March and was originally focused on providing support for people suffering from depression and anxiety, but will now turn its sights onto preventing suicide around Australia through mental health programs and in-school education. "The challenges of mental health of suicide are so large that we need every shoulder to the wheel," Gillard said. "We do know that there are 3 million Australians living with depression and anxiety. We tragically know that suicide rates are at a 10-year high, more than 3000 Australians take their lives through suicide, an average of eight a day, six of them men. "With statistics like that with problems of that dimension then we do want to be making sure that everybody is working together and working hard so we're very open to working with others." While she said there still remains a lot of work to do to reduce stigma around mental health issues and promote safe environments for people to reach out for help, Gillard told HuffPost Australia that individuals around the country have become more open to discussing issues such as depression and anxiety -- which in part comes down to the efforts of bipartisan-run organisations such as beyondblue. "I do think that the Australian community can congratulate itself on having opened up the conversation about mental health and about suicide and I pay a big tribute to Jeff Kennett in establishing beyondblue," she said. "Before we were putting the statistics out there, encouraging people to have the conversation it was easy for people to be in their homes thinking, 'No one feels like this, I'm a real oddity, no one's like me'. "Now people understand that many Australians are going through the same feelings, the same emotions, the same journey, the same continuum of mental health and that means that they're more prepared to come forward and talk about their own circumstances." Gillard transitioned into the beyondblue Chair role on July 1. While Gillard's time as Prime Minister was, at times, tainted by abuse -- both online and in person -- she said beyondblue's naming of her as Chair has been seen positively by people in the community and gives her the opportunity to continue promoting mental health awareness in public. "The reception in my view was overwhelmingly positive and many people have come up to me in the streets since when I've been moving around to congratulate me and to start talking to me about beyondblue," she said. "When I was actively involved in politics, we did do work on mental health. I'm very proud the first Budget I had as Prime Minister had a major package of reforms and new funding for mental health. "To have the opportunity now to continue all of that with an organisation that has the well-deserved reputation of beyondblue is just a terrific thing." And as for women in positions of employment experiencing similar situations of abuse -- or for anyone who may be battling mental health issues -- she has two messages. "I talk to people about how important it is to have a sense of purpose about why you're doing what you're doing," she said. "When you can see the bigger purpose, even though there are days where you get lots of criticism, it's easier to lift your head and lift your eyes and say, 'Well, I'm definitely going to go on with this because this sense of purpose is so important to me'. "The best advice I could give is reach out for help if you need it. Certainly, the best way of ensuring your future is as strong and as bright as it can be is to reach out for help. "That can be done in a variety of ways, beyondblue has resources -- we have a telephone helpline -- there are many mental health professionals, there are young peoples' services including Headspace, there are places to go and people to talk to, so do't be afraid to come forward and say that you need assistance."